Happy Friday to all! Ok, in a few short months, Hellcat will re-debut in an all new series. Depending on how that goes, I am guessing a lot of her back issues will see some heat. Obviously her first appearance and origin will be front and center. But here is a little gem that may also see some pickup! 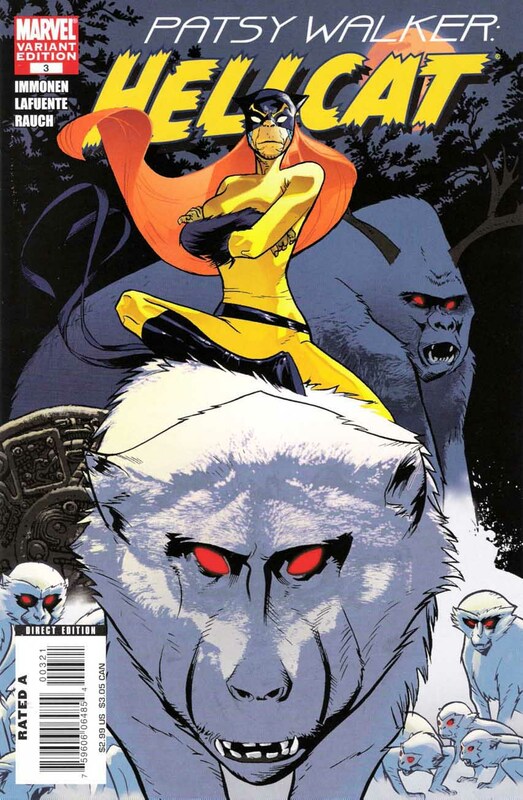 I give you Patsy Walker: Hellcat #3, the 1:10 Marvel Apes variant. By Stuart Immomen. What’s so special about this variant comic? It’s her first and only variant! We know that will change in December, where I am sure there will be about 10 different ones for #1! These are available at many online shops right now. All under $10. But here is something to make note of. The regular print has a print run of 8,500. So with this being a 1:10 variant, that means there is possibly only 850 of these out there! If her new comic does take off, people will want this variant. And imagine if there is a lot of cosplayers soon with Hellcat outfits. Go get one of these! Hold on to it. Good luck! Thanks as always for you post. Great post. Love all the covers for this series, too bad the story inside was one of the worst Hellcat runs ever. Fingers crossed for the new series! I just can’t buy those ape variants. They’re as bad as the cosplay variants IMO. They aren’t great, Hellcat is better than many but the cosplay variants are the worst thing to happen to comic covers in…possibly ever.